There are different types of Portable Water Filters that meet whatever water purification need you have, all in compact portable designs. The Best Portable Water Filter is the the one that gets the level of filtering you need, in the environment you need it to work in. If you’re trying to filter muddy outdoor lake water, then you need a specific type filter for that. The best portable water filters are listed in the order of most simple to most complex. If you want to purify tap water, then a gravity type water filter will serve you well. If you’re into nature like I am, then there are very good special filters that are powerful enough to make outdoor water safe. When I go camping, hiking or backpacking, I personally use a combination of one filter (Katadyn) and one purifier (UV Water Purifier) to be 100% sure I don’t come down with any water related illness. The Katadyn is for filtering dirty water, and the UV purifier is to make sure it 100% safe from microbes that can make you sick in the woods, where help is not always readily available. They are small, compact and you can easily carry them around in your backpack, daypack or even pocket! 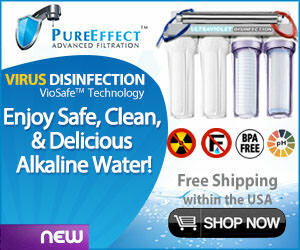 You can make your best water even better by using a Portable Alkaline Water Filter. These are usually water bottle filter types (like the Portable Water Ionizer or Tygo) that add alkaline minerals that are lacking in most tap or bottled water, and transforms your acidic, unhealthy water into highly refreshing, better tasting and more healthy alkaline water! 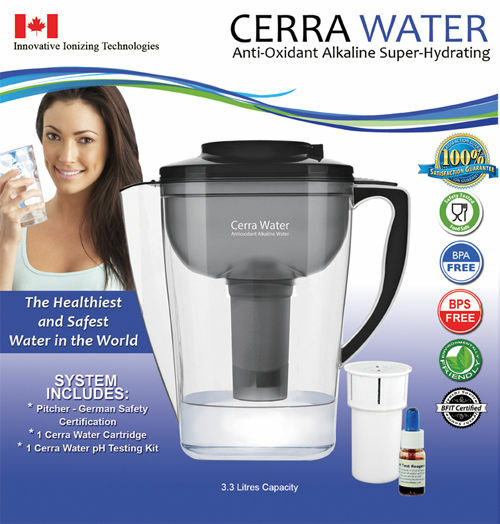 They actually work well, and If I didn’t have an Water Ionizer (which also makes the water ionized, adding more hydrogen and electrical potential, turning it into a powerful antioxidant, also known as ORP rating) I would just use one of these alkalizing filters. A Portable Water Filter Bottle, is normally a BPA free (you don’t want to add more toxic chemicals, since you’re trying to remove them) water bottle with a small sized filter inside of it, like the Berkey Sport Water Bottle Filter pictured above. They are the easiest to use of all portable water filter types. Just fill the water with the water you need to filter, and sip up through the internal straw filter, and you get purified clean and safe drinking water. These are inexpensive water filters that can give you some insurance against drinking toxins and stuff that can make you sick. They are a far better option than having nothing at all, but I personally would zap the water if it is from a still pond or lake with a UV water purifier (shown below) first, and then filter it though the bottle filter. A Pitcher Water Filter (like the Brita or Pur) is a really simple filter that is primarily for indoor use. Made for tap water to be poured into the top of the pitcher, and better tasting water comes out when you pour it into a glass. Most are not very powerful, with the a notable exception, which do not get out the toxic fluoride put into most people’s tap water. They primarily get rid of the “Taste” of chlorine, not the chlorine itself. They may get better in the future but most are simple ways to make your tap water taste better, no less, no more. The notable exception is the Clearly Filtered Water Pitcher which does get out fluoride. The Zero Water pitcher is good, but does not say it gets the fluoride out. If you want a real water purifier, opt for a good gravity filter like the Berkey Water Filter line (shown below). These are very powerful and durable filters that not only look great, but work great and last a lifetime! A good Gravity Water Filter like the top of the line Berkey Water Filter, is one that I do highly recommend! They are powerful water filter units that get the harmful additives in your tap water out. They can purify almost any water (lake, river, stream) and turn it into ultra purified drinking water. They also last forever as they are made durable and are very beautiful units too. They have a specialized fluoride filter, that most others lack, and is another reason I love them so much. They not only look like high end equipment, they actually are! It is a water filter that you can use at any outing and people will ask you about it. For home use, parties, outings or get togethers, there is no better portable water filter. 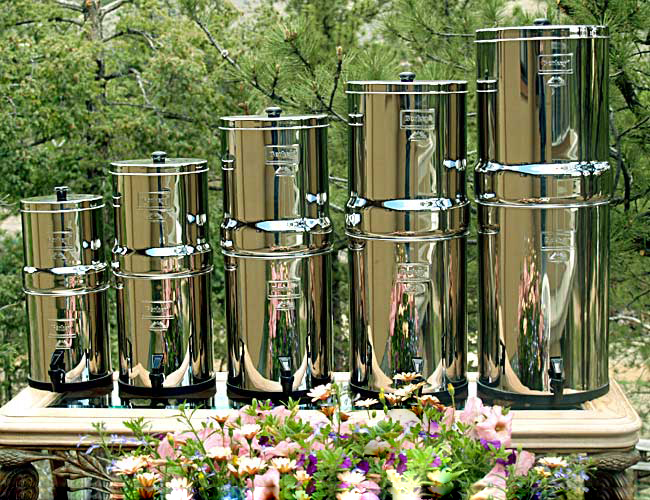 I like the Big Berkey myself, which you can see a detailed review at: Big Berkey Water Filter Review. 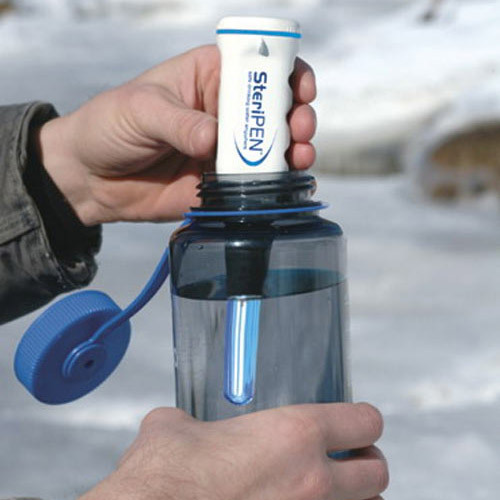 The Portable UV Water Filter (like the Steripen pictured above) is one of my favorites. It is not really a filter at all but a water purifier. It does not filter (remove objects out) rather it zaps living organisms in your water with ultra violet light and sterilizes them so they do not make you sick. It won’t remove chemicals, sediment, fluoride or chlorine, but it will zap the harmful things like giardia, viruses, bacteria and protozoa that can make you very sick. You’re in nature because you want to be healthy and enjoy yourself not be sick, so that’s why I highly recommend you have this if you are using a straw or water bottle filter. If you are using a more powerful type filter like reverse osmosis or a Katadyn Pocket Water Filter (made for hiking, camping and backpacking) then you don’t need it, even though I personally have and recommend both the Katadyn and UV! I enjoy being healthy and won’t shortchange myself. 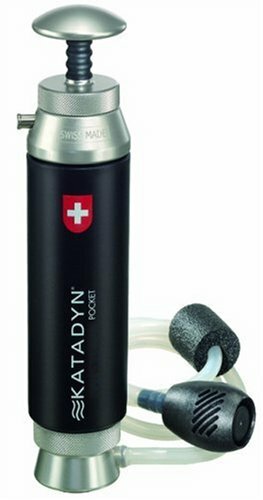 The Katadyn Portable Water Filter is my personal favorite. The one pictured above is the Katadyn Pocket Water Filter. I love it because it needs no electricity, is very sturdy and is built to last. There is nothing worse than being in the middle of the wilderness or dying of thirst and come to a questionable source of water (lake, pond, etc) and finding out your batteries are dead, your water filter is broke, or not working at all! They do offer a hiking water filter models (Hiker Pro and Vario) that are less expensive (plastic models) which are rated pretty well, but again I want to be 100% sure, when I need it, I can get clean and safe drinking water from any source! All you have to do is put one end in the water source, and use the manual pump to push water through the ultra micro filter. It down to the micron level, and is specifically made for questionable outdoor water sources. Having a Portable Reverse Osmosis Water Filter provides you the highest level of filtering, as RO removes practically everything from your water. It is what high end water purification systems use as the base for clean water. It removes fluoride, chlorine, chemicals, flushed prescription medicines, and most pathogens (viruses, bacteria, fungus, protozoa, etc.) from your drinking water. You can use these anywhere, and as long as you don’t drop it off a building, run over it or accidentally crush it (these are plastic units, as most are), you will have highly purified and safe drinking water wherever you are. The main thing is to use at least one of these methods, or ideally two (adding the UV filter, unless you’re getting the Katadyn or RO filter, see Reverse Osmosis System Reviews) then you can rest assured that you will be safe and have access to clean drinking water from any water source.